You may look at a piece of gym equipment like a treadmill and say, “Big deal. I get on and run…so what?” I really can’t blame you. At first glance, it’s pretty unimpressive and straightforward. And if you’ve got one in your home that’s become a laundry basket, you’re likely even less enthralled by its benefits. A treadmill can be one of the most effective pieces of exercise equipment if your goals are to improve your cardiovascular fitness and drop a few inches around the waistline—and it’s not as straightforward as you might think. Look, I admit when I use the treadmill I do what’s called steady-state cardio. I set the single speed on an incline and spend 20-30 minutes on it per session. But that’s not even close to being the most effective way to reach my goals. Not all running is created equal, and the way to get the most benefit in the least amount of time from a treadmill session is to use intervals. With interval training, after a warm-up, you’d move back and forth between high and low speeds to stimulate your heart rate, incinerate calories, and increase your metabolism around the clock. To effectively use your treadmill for interval sessions, you need to get on about three times a week for about 20 minutes per session; you can do one or two more sessions once you’ve grown accustomed to it. You should start off with a 5-to-10-minute warm-up walk or very light jog on the treadmill to get your heart pumping, muscles loose, and temperature up. (Don’t start by running; you could hurt yourself!) From there, you should run for 30 seconds, then switch to a 30-second walk, followed by run/walk intervals of 60 and 90 seconds, repeating the pattern two or three times. Next, you can do some incline intervals. Alternate between jogging at two- to five-degree inclines for one minute and running at a one-degree incline for one minute and repeat two to five times. Cool down by walking for 5 to 10 minutes…and voila! You’ve just used a treadmill as efficiently and effectively as humanly possible! 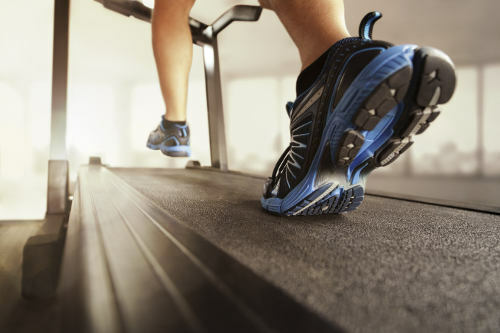 Treadmills are probably one of the most useful and beneficial pieces of exercise equipment available, and knowing how to use them to their full potential is the key to their efficacy. Spend less time exercising and more time living with interval training!